So here I have some simple pink halfmoons with black and white stripes. I added some black glitter and rhinestones to finish off the look. I think that these would look great matte too! There's a retro vibe to this that, combined with the bold stripes and bubblegum pink, reminds me of the original Barbie dolls. I started with American Apparel T-Shirt. Then I used a striping brush and American Apparel Coney Island to paint on the halfmoons. I used a black striping polish to paint the stripes. Finally I applied the black glitter and rhinestones with a dotting tool and top coat. Have you decided on your Valentine's Day manicure yet? Feel free to link me or tweet @preciouspolish with your nails. I'd also love to hear about your plans for the holiday if you have any :) See you tomorrow when we resume the geometric challenge! I'm so glad you're posting more often now :) I'm always looking forward to see your designs! This looks awesome! 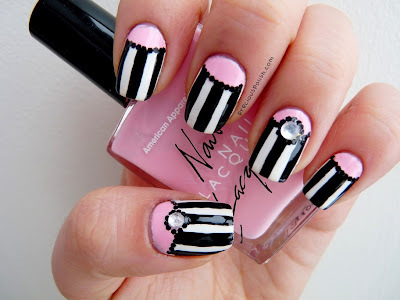 I normally don't wear pink on my nails, but I would wear this design! Oooh definitely looks vintage Barbie-ish haha. Awesome, Brittney!